The disc-like speaker is a little over 4 inches wide, with four lights on top presumably matching those on the full-sized Home, according to photos and text from the product page, shared by Gizmodo. The device should weigh less than a pound, and cost $49. 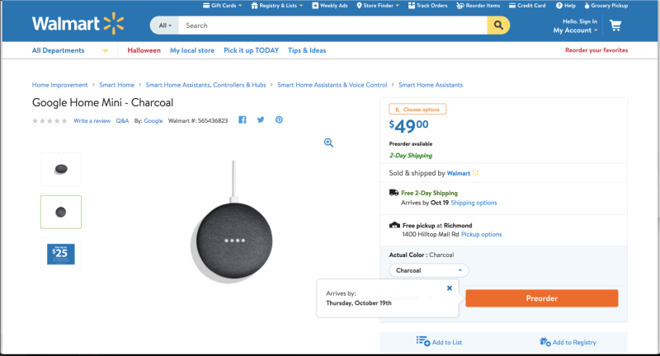 The leak would appear to back up Droid Life information from last month, which also suggested that the Mini will come in three colors: charcoal, gray, and coral. The device appears to be a direct competitor with Amazon's Echo Dot, which costs $49.99 and likewise serves as a cheaper alternative to a full-size speaker. The regular Google Home costs $129, and hasn't achieved as much traction as the growing Echo lineup, despite Google Assistant often being considered a better voice assistant than Amazon's Alexa. Amazon was the first company to succeed in smartspeakers, and Alexa now integrates with a number of apps, services, and smarthome accessories. Other Google products anticipated on Oct. 4 include two Android phones, the "Pixel 2" and "Pixel 2 XL," plus a "Pixelbook" Chromebook with a stylus. Apple's first smartspeaker, the HomePod, will only ship in December for $349. Unlike the Echo or Home the product is being aimed at an audiophile market, helping to explain its richer pricetag.